The importance of friendships is priceless beyond words. As I’m writing this, I’m so excited to be flying back to Indiana later today to spend time with four of my close friends ( the fifth friend, Denise, lives in Alaska now and isn’t able to join us this year! ), the Laker Chicks. We became friends when we all lived in Muncie, Indiana when our kids were young. We’ve been getting together at one of the friends beautiful lake home each summer now for over 25 years! 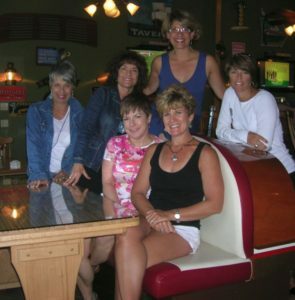 The photo shown here is of all 6 of us Laker Chicks, Kim, Martha, myself, Debbie, Denise and Gayle. To know I have this group of friends that support and love me is priceless! Oh the fun and laughter we have shared over the years! I hope you have friends too that you feel this same way about. I have other friends I’ve written about over the years as well, Donna my friend since first grade (55 years ago! ), Debbie my friend since second grade and Sharon, my friend since 5th grade. To me it’s been important to keep up with these precious friendships over the years, even though we all live in different states now. I cherish each of these friends and my many other friends I have made over the years and my most recent friends. Each have come into my life at so many different times and seasons. It’s up to each of us to nurture and keep our friendships strong. Some friends may not keep up with you as you do with them, and you still send them love, only you don’t need to take it personally. They are at different places in their lives and journeys here too. My three sisters are my friends, Kathie, Carol and Karen. I keep up with them and their lives as regularly as I can, and I feel so blessed to have them in my life. To have a positive team of people in your life, is vital for your sanity and growth. Each friend plays a different roll at different times. You know who they are when different things come up, that would be the best to talk and share with what’s going on. I’m not sure who I would be or where I would be without my friends! You all know who you are, past friends, friends who have been with me all along my journey since I was a child and all of you newer friends. I cherish each of you and I have much appreciation for all of you! Have you reached out to your friends lately? If not, why not pick up the phone and have a conversation today? Please leave me a comment below about how you feel about your friendships. How beautiful Connie! I too have a group of friends, 10 of us since college (almost 50 years).We call ourselves EFF (extended family fund) because in raising our kids together we set up a fund for token scholarships when each child graduated from H.S. and performed silly skits reflective of each child’s personality or dreams. (EFF Players, lol).We gather annually for our Kwanzaa celebration along with our families, go on trips and still have sleep overs. In August, my husband and I will join my lifetime friends at Atlantis in the Bahamas to celebrate one of the Mitchell girls (there are 3) 70th birthday. My best friend Joyce, since 5 years old passed away 8 years ago and I miss her dearly. I honor her by being mamajoan to her children and grandchildren. How blessed are we to have the love and support of close friends on this journey called life. Much love, mamajoan.